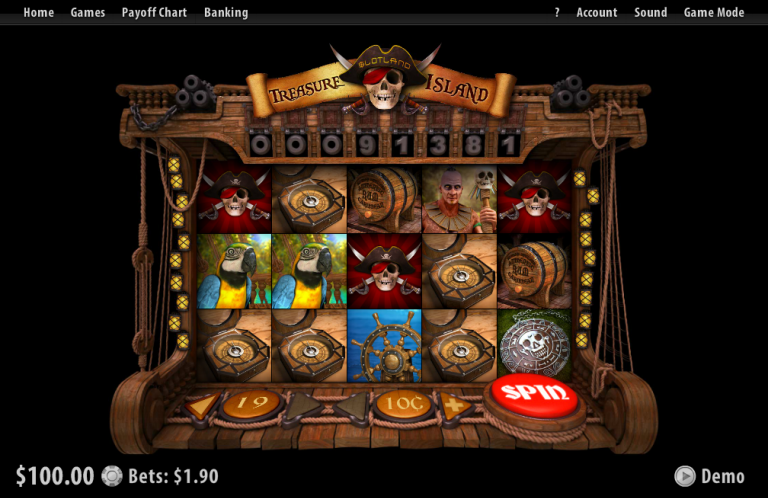 Slotland Casino has recently released their newest slot, Treasure Island. 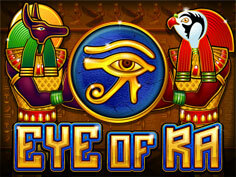 In this five-reel, progressive jackpot slot machine, pirates, natives, parrots, and other symbols appear on the paylines. 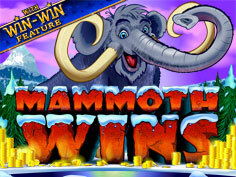 Winning combinations are made when three or more matching symbols appear on an active payline. Plus, there is a WILD symbol that DOUBLES your win. But what makes Treasure Island really fun is the Treasure Hunt bonus round, which is launched when three Treasure Hunt scatters appear on the reels. 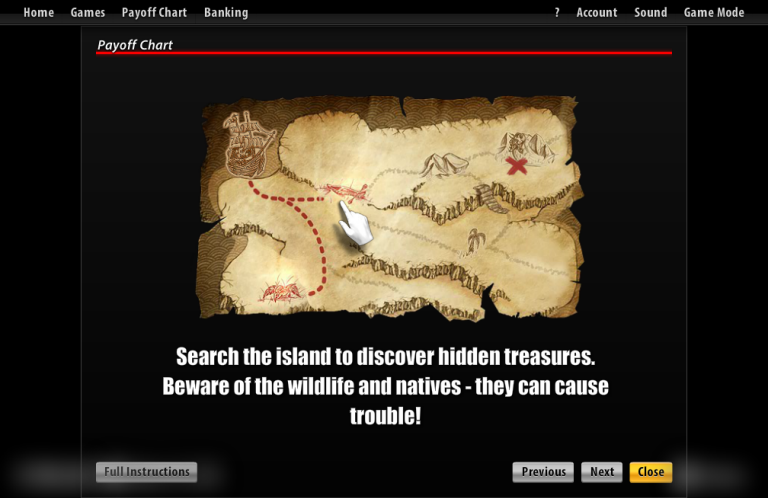 At the beginning of the Treasure Hunt look at the island map and decide where to anchor your ship. In the second step, select a satchel you wish to take with you; each satchel contains a random selection of items you may find handy when dealing with the natives. The Treasure Hunt may now begin! 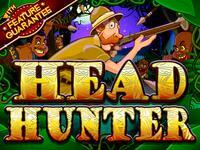 Your goal is to explore the island and to find as many treasures as possible while avoiding dangerous wild animals and exchanging items with natives. After mooring, select a place you wish to discover first. Then continue discovering places that are close to the already visited sites. There may be a huge treasure hidden on every island you visit! You can find this treasure randomly or you can find a Treasure Map that will guide you to the location of the treasure. Sometimes, the island natives may disclose the location of the Treasure to you in exchange for some useful items you carry! Finally, if you hit five Corsair symbols on a payline while betting at least a total of $20 per spin, you win the Progressive Jackpot. Treasure Island slot machine can be found only at US-friendly Slotland Casino, and only my blog readers get $28 FREE after registering for an account. 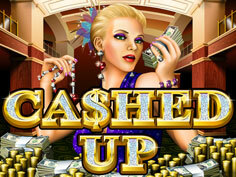 Depositing players get a generous 200% bonus on initial deposits between $25 and $100 as well. Vistagaming Software is a brand of online bingo software that has more than just online bingo — it also has table games, video poker, and slot machines. 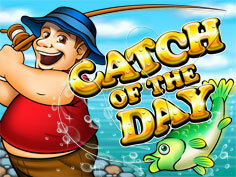 In essence, Vistagaming Software is more of a small online casino software provider that also has online bingo. 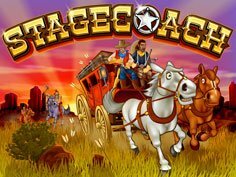 Since I’ve been focused on online slot machines in my most recent posts, I thought that I would continue along those lines with a post about the Progressive Jackpot Slot Machines at sites that run Vistagaming Software. As of this writing, the top progressive jackpot is over $25,000! 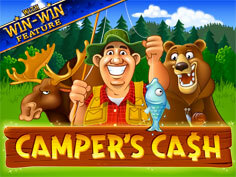 Here are the three progressive slots that you’ll find at Vistagaming Software sites. While these three slot machines may at first appear to be different, in essence they are the same slot machine. Each is simply a different skin, all playing for the same progressive jackpot. If you prefer a magical, mystical theme, go for Fairy Nights. Try Greek Myths if you’re into mythology and the gods. And finally, for a taste of the orient, check out Winds of Arabia. Bingo Fest is the only 5-star recommended site at The Online Casino Gambling Directory for these progressive jackpot slot machines. They are currently offering $5 free to all new members, as well as a nice 500% bonus on initial deposits. In addition to being US-friendly, I’ve found Bingo Fest to be credit-card friendly as well, making depositing a breeze. Bingo Sky and Cyber Bingo are also good choices. 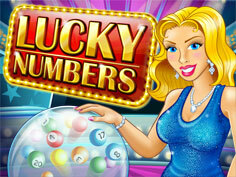 Check out my complete list of all online slot machines that you’ll find at Vistagaming Software sites. 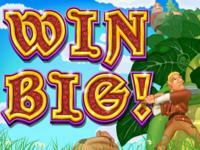 24 New Online Slot Machines… You Could Win a Million Bucks! 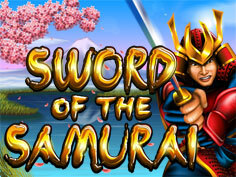 Check out the new online slot machines available at NuWorks online casinos. Click a banner to take you to a full-page description of the online slot. 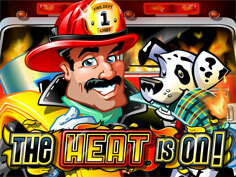 Alternatively, you can just go to BuzzLuck online casino and download and register to play all of these slot machines. 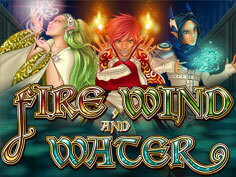 Be sure to take advantage of their 100% match for new players, good for up to $868. 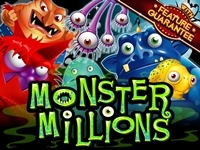 The Monster Millions online slot has a jackpot that starts at $1,000,000! 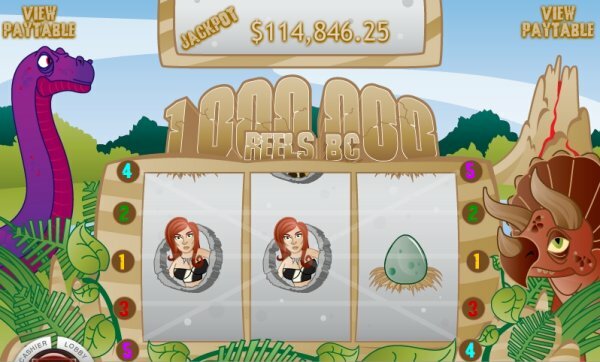 One Million Reels BC was last month’s new progressive slot machine from Rival, and no one has yet hit the jackpot. Moments ago, the jackpot stood at nearly $115,000. 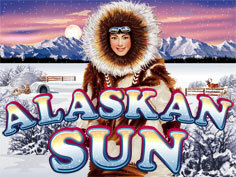 If progressive slots are your thing, take a spin in time back to One Million Reels BC! Players from all US states except Kentucky are accepted at Rival-powered online casinos. Wow. A million dollars for losing a big hand. Sound too good to be true? Well, it’s not. 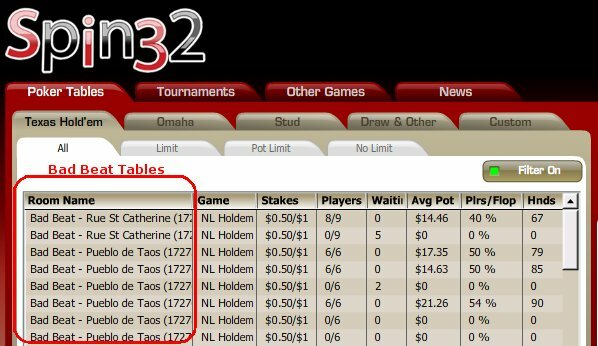 All you need to do is log into your Spin32 Poker account and go to the tab marked Poker Tables. Just take a seat at one of the specially marked Bad Beat tables with stakes that start at 0.50/$1 and go up to $5/$10. 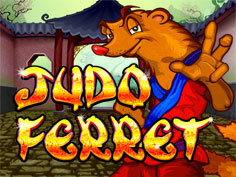 – Only two players can be active at the end of the hand, and it must go to showdown. Sign up today through February 28, 2009 at Spin32 Poker; use coupon code 100FEB09 to earn a 100% bonus on deposits up to $500. Spin32 Poker welcomes players from all US states. 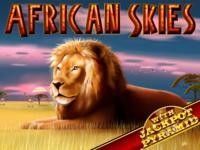 The jackpot on Strike Gold progressive jackpot slot machine at Rival-Powered casinos surpassed $63,400 today! 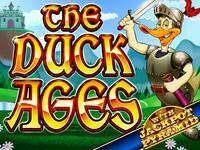 Unlike some progressive slots, you qualify for the jackpot with just a $2 wager rather than a $3 wager. Check it out at these top-rated Rival-Powered casinos, and let me know if you hit the big one! Congratulations to Liz B. who hit the first ever progressive jackpot win at This Is Vegas and Rival casinos. Her $3 bet turned into a $52,504 jackpot win! Both Major Moolah and Strike Gold are climbing in value — who will be the next big winner? 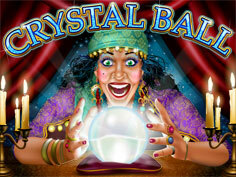 Remember that at This Is Vegas all weekdays players get 2x comp points and 50% unlimited bonuses on weekends. Psst! 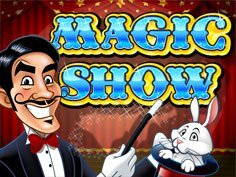 I’ve also heard that John W., the casino floor manager at This Is Vegas, has been handling out random mystery bonuses to the players at This Is Vegas! 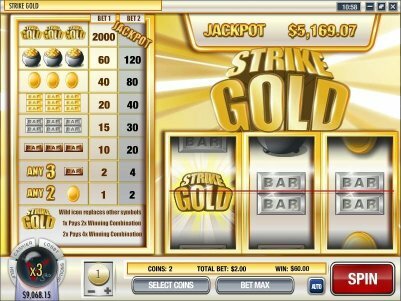 Just launched — Strike Gold progressive jackpot slot machine. This is a classic three-reeler from Rival-powered casinos that has a progressive jackpot starting at $5,000. Unlike some progressive slots, you qualify for the jackpot with just a $2 wager rather than a $3 wager. The Strike Gold symbol substitutes for all other symbols, including the gold nugget, bar, and pot-o-gold symbols. 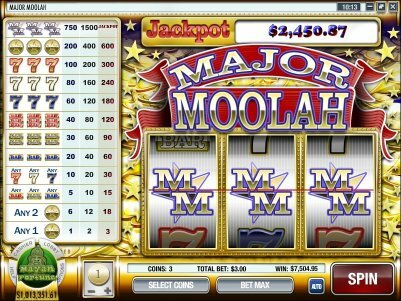 Last month, anÂ Online Casino Gambling DirectoryÂ player at All Jackpots casino won $12,712.23 playing Mega Moolah, a 5 Reel Microgaming Progressive Slot Machine. 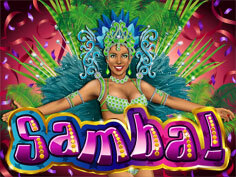 This player, based out of the United Kingdom, signed up wth All Jackpots in May 2007 after finding it listed at The Online Casino Gambling Directory. Congratulations to this lucky player for winning over $12,000! 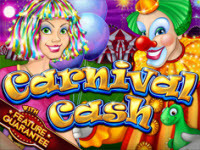 You can try your luck on Mega Moolah or the other progressive slot machines at any Microgaming Casino. 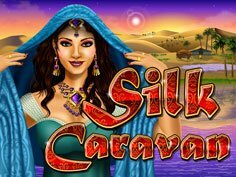 I’d suggest CasinoShare.com as a starting point (they’ll give you $2008 FREE to get you started), and then work your way through my list of Microgaming Casinos. 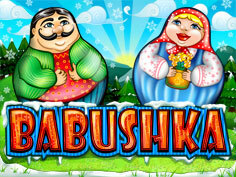 This is a great time to go for the millions, so get on over the All Jackpots and try your luck!